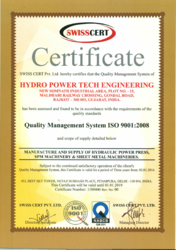 Established in the year 2011, we, “Hydro Power Tech Engineering”, are counted among the prominent Manufacturer, Exporter and Trader engaged in offering our clients with a commendable range of Iron Worker Machines, Cutting Machines, Punching Machines, Multipurpose Machines, Shearing Machines, Notching Machines, CNC Angle Punching Machine, Hydraulic Iron Punching Press, etc. At our premises, we manufacture these machines with the aid of modern tools and technology, installed at our infrastructure facility. Apart from this, to cater to the exact demands of customers, we work in close coordination with them. Backed by a team of dexterous and diligent professionals, we have been able to carry out the business related operations in prominent manner. These professionals are hired after stringent assessment of their business skills and domain expertise. Well-versed in their respective domains, our team carries out business related tasks in efficient manner. We have constructed a sophisticated and spacious infrastructure facility, which is segregated into different functional units for proper execution of business-related operations. These units are manufacturing, quality controlling, warehousing, R&D and packaging. All these units are handled by a hard worhard-workingprofessionals, which is well-versed in this domain. In addition to this, we have a vast distribution network, which enables us to dispatch our range in committed time-period to the customers' premises. Owing to our exclusive range of products, we have gained customers from Africa and Gulf Countries. Under the guidance of our mentor, 'Mr. Rupesh Amreliya', we have been able to commence our business related operations in da exterous manner. His vast industry experience, knowledge and expertise have gained us huge client-base. Our organization had established a sophisticated infrastructure in Rajkot, Gujarat. We have partitioned our infrastructure into various departments to carry out all our business related activities in a streamlined manner. The departments are manufacturing unit, quality control unit, research & developments unit, warehousing unit and sales and marketing unit. The major unit of our infrastructure id manufacturing department, which is well-equipped with advanced machines and tools. We have appointed a team of dexterous professionals, which holds vast experience in this domain. These professionals help in manufacturing our entire range of Hydraulic Presses with utmost precision with their in-depth knowledge. With the help of these professionals, we have been able to offer a quality assured range of products to our clients as per their requirements. Our professionals also work in close coordination with each other to complete the given assignment within the stipulated period of time. We strive to become favorite among our clients and for the same, we manufacture, supply, export, trade and import a comprehensive range of Hydraulic Press Machines. In order to establish long-term relationships with our customers, we manufacture our range in adherence to the specifications laid by them. Further, dispatching our product-line in stipulated time-period, we have attained their huge contentment. Owing to the sound infrastructure facility, competent team, wide distribution network and qualitative product-line, we have gained huge client-base.